There is a great deal arriving in iOS 12.2 such as Apple News arriving in Canada, and a quartet of new Animoji characters. Monday's beta update had a few notable changes, but mostly cleans up issues introduced in the past that have made headlines. One of the first noticable changes is a refreshed icon for Apple News. It is now a stark white icon with a red 'N' emblazoned in the center. There have been a few tweaks within the News app during the 12.2 beta cycle including a launch in Canada and signifiers that Apple is close to launching its paid news service that has been rumored for some time. 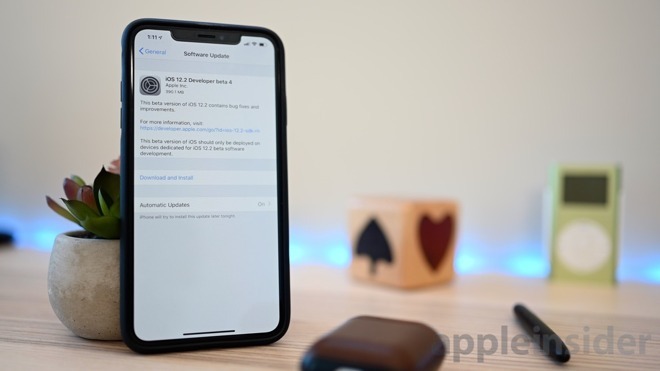 The latest beta update weighs in at a hefty 390MB on our iPhone XS Max. Another change is in Control Center where the remote widget has been continuously tweaked during the previous betas. Now the icon has been changed to a mirror the Apple TV Siri remote. Within the remote widget, the TV and the microphone button have swapped spots. While playing content, the skip 10 seconds forward/back buttons have returned on the lower corners of the touch surface. Apple TVs have a new volume interface when accessed via the AirPlay button and content is playing. The new remote button also makes an appearance here. Be sure to check out what changed last time in iOS 12.2 beta 3, beta 2, and beta 1.